The Segway ES1 Scooter has large, 8” tires, a no chain engine,front LED lights and and a digital display that will tell you all the data you need to know. The scooter is also equipped with front heavy-coil suspension that will help in the front shock absorption. The easy to clean foot pads featured on the scooter can be easily cleaned, and the Segway is lightweight and easy to carry. Scooters first appeared on the market around the year 2000, and since then they have only been getting more advanced. From normal scooters, to electric kickscooters with advanced mechanics, there are plenty of options to choose from. That, of course, means that it can be difficult to choose one specific kick scooter to buy. Whether you are looking for a gift for your child or for yourself, the amount of choices out on the market can be overwhelming. Whether you are looking for an adult electric scooter to ride around your neighborhood, or for a an alternate means of transportation for when you go to work, the Segway ES1 can be a great solution. Not only is it a great investment for every day errands, but it’s ideal for those days when you just want to relax and cruise around the park. Either way, the Segway is a great source of fun, no matter if you need it for work or if you want to give it as a gift. Since Electric kickscooters are still quite new on the market, we decided to compile a quick review that goes over all the functions of the Segway eScooter and why you may want to invest in it. The fuss-free design of the ES1 is definitely something that Segway was focusing on when manufacturing this scooter. The Segway has a basic Segway Kickscooter ES1 design and does not have any useless accessories that could clutter the frame and make riding troublesome. All you need to do is get on, and ride away. The simple design allows the kick scooter to be lightweight, compact, and easy to carry no matter where you go. Taking the ES1 onto buses or trains can be done quietly, and without any inconveniences. The Segway electric Scooter has a very simple, black appeal that fits well with a sporty theme. The handlebars are also covered with a comfy, gray grip that is designed to have an anti-slip design. The brand marks are located around the top bar in a light gray color that doesn’t distract from the overall appeal of the adult electric scooter. There are also bright, red reflector stripes on the sides of the easy to clean foot pads that will help keep you safe at night. The Segway ES1 eScooter is a significant improvement from its previous sister model. The main difference being that the ES1 now has rubber wheels. This means that you will no longer have to deal with inflatable tires, that are bothersome to change and can be punctured easily and go flat. This was a huge problem with the previous Segway models since it was common to get a flat tire in the middle of a ride. Luckily, Segway decided to take a step forward and eliminate this inconvenience.The tires are the front measure around 8”, while the tires are the front a bit smaller, measuring in at about 7.5”. The front of the Segway Kickscooter has also been designed for front shock absorption. The heavy-coil suspension located on the front wheel will help minimize any sort of bouncing that could occur when riding without it. The wheels have been attached in such a way to give the rider a good variety of speed, self balancing, precision and comfort, no matter where or how long they ride. 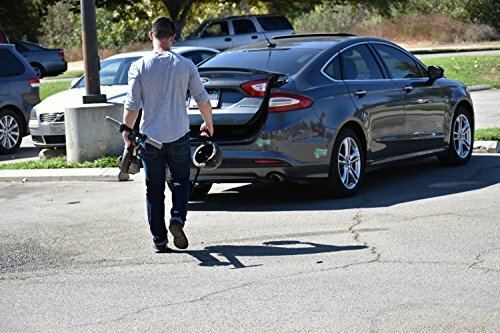 Many customers have reported that the wheels deal very well when going over small bumps and curbs. This makes the Segway electric an all-around great companion for riding around the city and neighborhood. Check out the Segway MiniPro as an alternative. The antilock brake system is manual and located on the rear wheel. You will need to step on it manually with your foot so that the friction stops the Segway Kickscooter from going faster. This may be quite troublesome to learn for beginners, but once you get a hang of it it should become like second nature. On the left side of the footpad you can also find an alloy kickstand that is easy to put up with just your foot. This is definitely an improvement from Segway’s previous models, where you had to bend down to set up the stand. It’s easy to see that Segway has taken many steps forward in improving this model from its predecessors. The Es1 is also 1kg lighter than its predecessor. Some assembly will be required when first opening the box. This is vital to know if you are planning on giving the Segway Kickscooter as a gift that will want to be used immediately. Luckily, the assembly shouldn’t take more than 15 minutes, and can give a good sense of achievement to kids and adults alike. The base of the adult electric scooter has a very effective, anti-slip layer of rubber that will help you have a good grip when cruising around. It will ensure that you won’t slip, or should you run over a bump you won’t immediately start wobbling. Segway is well known for having very stable and reliable scooters, and the Segway ES1 Scooter is no exception. You can go over unstable pavements and rocky roads and you will still be able to easily maintain self balancing techniques. All of the materials used to manufacture this adult electric scooter are of high-quality and have been approved by various safety organizations. The ES1 electric scooter can go up to 15.5 miles on a full charge, which is a stunningly long time when you compare it to other scooters in the same niche. This is more than enough time to run all your errands. 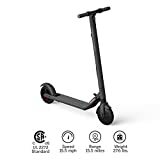 Should you run out of battery at some point, you can easily pick up the Segway Kickscooter and carry it thanks to its lightweight features. It’s easily foldable and can be folded in half within seconds when you need to get onto a bus or a train. Segway was definitely trying to manufacture a very effective and efficient adult electric scooter, and the ES1 is a great example of such qualities. When riding, you will be able to choose your desired speed from low to top speeds on the digital screen that is located between both of the handlebars. This will save you the trouble of having to constantly ride the accelerator paddle. Segway also decided to integrate LED lights in the design of the Segway ES1 eScooter to help make it more safe and all-around versatile. The lights will help illuminate the path you are riding when it gets dark, as well as helping you see where you are going They will also help to make you more noticeable when you are riding. This is a great feature to have, especially if you want your children to ride electric scooters safely when the sun starts setting. It’s definitely a good idea to purchase an additional battery if you are planning on using the Segway Kickscooter on a daily/regular basis. It will help reduce the daily wear and tear that you will be putting it through, helping it last longer. The Lightweight electric ES1 scooter is suitable for both kids, teens and adults alike. It’s important to take a look at the specific dimensions of the Segway Kickscooter ES1 to see if it will be the best fit for you or a relative. As long as your kids are mature enough to handle the device, then there shouldn’t be a problem in giving it to kids as young as 12. It’s a great means of transport for anyone that wants to cruise around the neighborhood, to school or to work. We like the Segway ES1 eScooter high performance thanks to its new and developed features. Mainly thanks to the new and improved rubber wheels, the 15.5 miles run time and the heavy-coil suspension. The LED lights also help to keep you safe when you are riding after nightfall. All of these features help make this scooter versatile, effective, and safe. See the Segway ES1 Ninebot Kickscooter as an alternative. The Ninebot by Segway as well as the Razor Ripstick caster board is another fantastic choice. There is now also a Segway ES2 eScooter high performance toy, also. If you are looking for other potential purchases from Segway, then we can wholeheartedly recommend the Segway MiniProSmart. It can carry up to 220lbs and is perfect for anyone above 16 years of age. It has a 1600 watt power engine, fantastic precision and great speed limit control. It can go up to 10 mph of top speed and has a free mobile app to help assist you should you need any help.